Predictia offers customized high resolution (up to 366 m) meteorological forecasts. This resolution is necessary in order to accurately represent the local topography and land use, including the urban heat island. The dynamical model used, the Weather Research and Forecasting (WRF) (WRF), represents the state-of-the-art in regional modelling of the atmosphere. WRF is also appreciated for being very customizable, so it is possible to adapt it to different scenarios and locations without loosing accuracy. The company has been supported in several projects by Santander Meteorology Group to achieve an optimal model configuration. This investigation group has extensive experience with the model, having participated in many projects of national and international scope. The forecasts service is based on the definition of one or more domains or regions, that can be placed anywhere in the world. The optimal configuration of these domains is customized for the client (e.g. parameterization choice) depending on the problem that is being addressed. Regarding the variables available in the forecast, the client can choose among a considerable amount of them. Standard variables: 2 m temperature, precipitation, 10 m wind, relative humidity etc. Sector-specific variables: 100m wind (wind energy), soil temperature (climatization of underground facilities), snow thickness on the ground (transport), apparent temperature (health, tourism) etc. 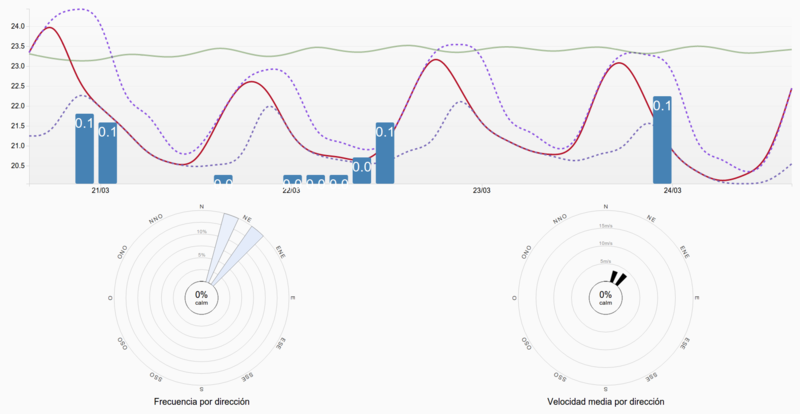 Dynamic meteograms ready to use in a web site using our visualization system datlas. Gridded forecast variables in the native grid or interpolated to a customized geographical projection, in netCDF format. Text files in several formats (JSON, XML) with forecasts in a set of locations or regions of interest. Standard mapping service (WMS) using our visualization system datlas. Issuing of alerts (early warning system) based on customized thresholds relevant for the user. 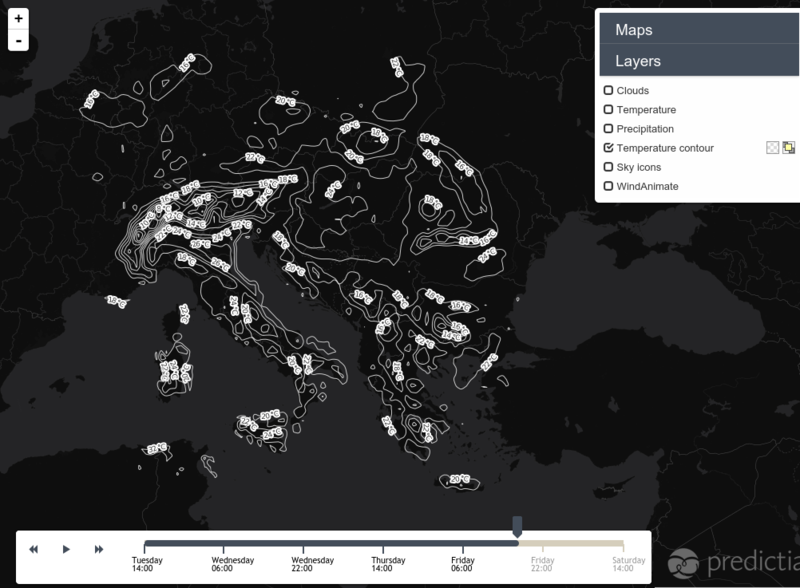 Retrospective forecasts of past periods, that can be used to assess model skill in a given domain, or to explore the local climate to search for favourable locations or to compute return periods. Multi-physics forecast ensembles for uncertainty quantification. Calibration system based on Kalman Filters using real time observations. Observed data assimilation in the model to increase its accuracy. To get further information about our meteorological forecast service, please contact us or have a look to the validation papers that we publish in scientific journals. After the second year a 20% discount is applicable. Customized services such as data assimilation, calibration and multi-physics are budgeted case by case.